The daughter and granddaughter of painters, musicians and opera singers, I was born in Paris into a highly artistic family. A soprano myself specialised in Italian opera, I have the sense of theatre and this comes across in the colour and richness of detail in my compositions. Having inherited from my grandfather, the bolognese portraitist Cesare Bacchi, a pronounced taste for the portrait, I turned quite naturally towards the human figure. Influenced by the symbolist movement in painting, the Art Deco period, and more particularly by artists such as Gustav Klimt, Fernand Khnopff and James Tissot, the proud, slender Amazons which I delight in painting take their direct inspiration from contemporary fashion. I started with studies in pencil and charcoal. I worked for a while in pastel before devoting myself completely to oils, the technique for which I acquired by copying the paintings of the Old Italian and Dutch Masters of the Renaissance. Highly sensitive to Japanese art, from which I learnt the importance of line and precision in the representation of colour and pattern on fabric, I attach the utmost importance to detail, and take meticulous pains to capture the precise nature of the texture and tissues I am painting. 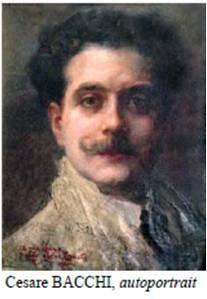 My grandfather was the famous portraitist Cesare BACCHI, one of the leading portraitists in Europe during the first half of the twentieth century. He painted notably the portrait of the King of Italy, Vittorio EMMANUELE III, as well as many personalities of the time (musicians, actresses, ambassadors, French and foreign statesmen…). His works were exhibited for many years at the Salon des Artistes Français, Paris. He won the silver medal in 1910 with his Improvisation and the gold medal in 1938 for his Verlaine au café Procope, now exhibited at the Absinthe Museum, Auvers-sur-Oise. BACCHI is listed in the prestigious encyclopaedia of art, the Benezit, as is his wife, Tanette OTIS-MÜLLER. My grandmother, Tanette OTIS-MÜLLER, was a virtuoso pianist (MOSKOWSKI was her teacher) and painter, listed in the BENEZIT, as is her husband. She is a direct descendant of the OTIS family, Boston, among which number a series of great patriots, politicians and statesmen. To name just six of her famous ancestors, one could cite James OTIS, one of the intellectual giants of the American Revolution and his sister, Mercy OTIS WARREN ; Samuel ALLYNE OTIS, congressman and 1st Secretary of the American Senate and his son, Harrison GRAY OTIS, the third mayor of Boston ; Elisha GRAVES OTIS, the inventor of the safety elevator and the famous American aviation pioneer and author, Amelia EARHART. My father, Primo ROSIMIRO, is a first-rate Italian tenor, and my mother, Evelyne OTIS-ROSIMIRO, a highly-talented classical painter and portraitist. Bathed in the world of art from her childhood, Evelyne quite naturally inherited the artistic talents of her parents. An early interest was the study of Japanese art, which she was personally taught by one of the aunts of the Emperor of Japan, Hiro Hito. Following in her father’s footsteps, she exhibited her work at the Salon des Artistes Français. She then worked for the Parisian gallery Rohan, on the Place du Palais Royal. For sixteen years, painting on silk, she provided cushions, lampshades, scarves and screens for the “Boite à Bijoux”, on the Rue de Rennes in Paris. In 1997 she painted an impressive altarpiece for the church of Saint-Lubin de Chassant. Forty huge paintings of hers have been specially commissioned by a collector of Saint Paul de Vence, for his villa in the South of France. Landscapes, still lives and flowers are frequently represented in her work, and she has sold literally hundreds of beautiful paintings.